BORONGAN. A place once described by a foreign national as a paradise in the middle of a wilderness. He was right. Bounded by the Pacific in the east and by a virgin forest in the west, this is indeed a paradise. Like the most parts of Samar, Borongan was blessed with natural riches: pristine beaches, untouched forests, and the never ending produce from the land and sea. Father Francisco Alzina, a Jesuit priest assigned in the evangelization of the island in the 15th century described the Warays as “slothful and lazy, a character innate to them all”. The whole island of Samar was richly blessed by Nature. It was a place where almost anything grew. This could have been the reason why the natives felt there was no compelling need for them to cultivate crops and grow them. If the land failed, there was always the sea to turn to. The observation was not of the Boronganon in particular. It was a general description of the Waray people but we can never blame the priest with his mistaken description for if we examine ourselves closely, he was right in many aspects. Working for forty years in the Samar-Leyte area, mostly Samar, Fr. Alzina had ample time to know the Warays by heart. He saw them as contented people having easy access to their biological needs for food and nourishment, and essentially happy as manifested by their love for the good life. The Waray loved the streets. It is for him, a stage for display. The Warays of old preferred to walk than ride. By walking the short stretches from his residence to the point of destination, he is able to avoid the bumpy ride in a carriage due to the bad road condition. This also provides him the opportunity to display his adornments for everybody to see. His decorative tattoos, gold teeth or baysil, and his clothes would go unnoticed if he rides in the confines of a carriage. If we examine the Boronganons closely, the accounts of the Jesuit would surely give us a few good laughs. The description made about the character of the Waray in general is apt to the Boronganon in particular. The Waray, Alzina wrote, was sociable. Never been burdened with the struggle for subsistence, he had the luxury to attend to and indulge his body, cultivate friendships and entertain. Given to vanities, he loves personal adornment, jewelry, fine clothes, and lavishes himself in personal care. The sociability of the Boronganon, though, is always associated with his innate hospitality. As has been the case in the past, a sarayaw would be organized for vacacionistas as a homecoming welcome; to students and fellow Boronganons on a brief respite from the taxing life in the city, and balikbayans revisiting the town of their birth. It was during the mayoralty of the late Atty. Victor Amasa, that these vacationers were accorded such warm welcome, not only by their relatives, but by the municipal government itself. This also holds true to the many welcome parties given in honor of visitors coming to the town for a peek. The Boronganons of today, like their forefathers, still love to entertain and be entertained, and they still love to lavish themselves with skin and body care. They may have done away with tabulilid (lime) as hair cleanser, and other herbal concoctions the old folks used to pamper their skin and body, but the penchant for looking posturawo (groomed and presentable) is still evident in the younger generation, even in the confines of their own home. Father Alzina, expelled in 1768 along with the rest of the Jesuit priests in the island, never stayed long enough to see Borongan and other parts of Samar metamorphose from its rural setting to what it is today. What may have remained to witness the transformation of Borongan was the hamorawon (molave), which reigned over the favorite watering hole of hunters, is now the center of the town. At the heart of Borongan lies a spring, named after a tree that once lorded over the area. The hamorawon no longer exists, but in its stead stands a centuries-old acacia, the remaining silent witness to the passing of Borongan’s history. The old acacia was a witness to the growth of the town and its people. It was there when one of the town’s first landmarks, merely a few feet away, was constructed. Rising above the Hamorawon spring, the stage was patterned after the shape of a giant clam. The two lobsters nestling atop the shell and the two mermaids in a striking pose holding the clam open make up the unusual architecture. The most unusual though, is the presence of the two crocodiles at the foot of the mermaids. If this was a practical joke by the man who ordered the construction of the auditorium possible in order to perpetuate his name, then Mayor Pablo Rosales, Sr., better known as Bu-aya (Waray term for crocodile) did make a lasting impression. As long as the auditorium stands, the man’s name will remain etched in that unusual, yet impressive work of art. The same acacia became the mute observer of Rizal’s (the monument, that is) restlessness. His monument became migratory through time before it stayed permanently in its present location. Rizal has made numerous trips from one corner of the plaza to another to make way for “scenic reconstructions” in the guise of landscaping of the town’s central park. For some years now, Rizal seems to be contented with where he is and that he no longer has any plans of transferring. Another victim to this restlessness was the kiosk, where important town meetings had once been held, local singing talents were pitted against one another, and political statements were delivered. Sent away on destierro, the kiosko is now the center of activities in Barangay Lalawigan, seven kilometers south of the poblacion. The banishment of the said kiosk was done for a reason and whatever the reason was, it, and the kiosko, had become an integral part in the lives of the Lalawignons, socially, culturally, and politically. The acacia saw the winds of change in Borongan: from the rise of new structures at the heart of town to the birth of modern politics and politicians, not only in the municipality, but the whole province of Eastern Samar. The Borongan Cultural Stage, in all its immensity dwarfed the Tilang (Hamorawon Auditorium) and the acacia across the street, and this same stage became the center of cultural, political, and social activities of the townspeople. Here, varied speeches of the scions of new generation politics had been delivered and new ideas presented, and the old acacia may have stood there in protest and horror when politics became nastier and dirtier in the passing of time. This old tree had also witnessed the four major 20th century fires of Borongan: one that razed the old St. Joseph’s Building in Baybay, one in Brgy. Tarusan, another in Brgy. C, and the last, the biggest fire that left a majority of families situated at the heart of the town, and the town itself, homeless. It was this fire in 1988 that gutted down the Municipal Hall that was erected in 1958. The last of which was in Brgy. Tarusan in 1990. Borongan has had a fair share of its ups and downs. So the town had received infamy in the news as one of the places in the country where typhoons make their regular calls. The place then was very lucky to have a minimum of five typhoons in a year. It was one of the 1998 typhoons that humbled down the acacia. 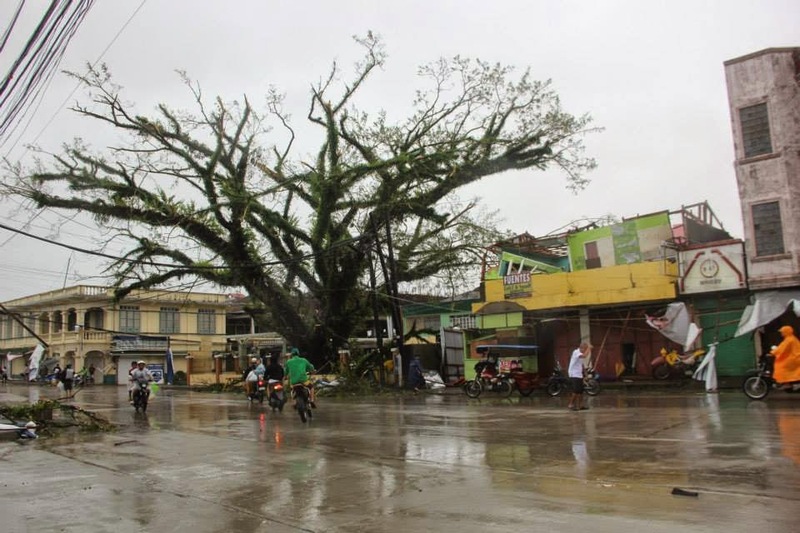 That old tree that stood proudly for centuries came crashing down to the center of the town at the height of the typhoon’s fury. It was this same force majeure (1984) that the Borongan Bridge, one of the two existing suspension bridges in the town, collapsed, due to the raging waters of the Borongan River. In time, the bridge was reconstructed, and is now a picture and a product of modern engineering. Call it “back with a vengeance”, the acacia never bowing to the onslaught of calamities common to the place is now standing more stately than ever, listening to the shouts and whispers of Boronganons as they move on with their daily activities. It remains there to hear the frolics of the children, who, despite bathing restrictions on the Hamorawon Spring a few feet away, cannot refrain themselves from enjoying its icy and refreshing waters. The strong winds never really humbled the acacia totally: it was only able to break its limbs and part of the trunk but not the roots. Holding to mother earth tightly, what remained of the acacia gave birth to new branches that now provide the tree a new pride. Borongan has come a long way. Rising from ashes and poverty, it has become a promising town with so much to offer: serene surroundings, beaches, waterfalls, places still undaunted by man’s greed that would very much appeal to tourists – both foreign and local, and maybe, just maybe a prospect for investments (if only our electric supply and communication facilities become stable and dependable). It is important to note though, that Borongan had had brisk commerce with the Chinese and the Dutch as early as 1127 A.D. The trade between the Chinese particularly the Sung and Yuan Dynasties (1127-1278 and 1260-1368) was extensive, proof of which were the Chinese pottery that were discovered in many parts of Samar island. When antique hunting became a fad in Borongan around two decades ago, Chinese pottery was discovered along the Borongan and Loom Rivers. Dutch merchant ships came later, in the 1600’s, to do trading in the ports of Borongan, and Capul in Northern Samar. Not long ago, Borongan’s commercial hub was in the port of Sabang, where Chinese and local merchants were engaged in copra buying and selling. This trade provided stevedoring and marina jobs to the residents of Sabang, Pepelitan and Hindang, and further north to Maypangdan. It also provided the older people a small livelihood in darning sacks and sewing the sacks closed when the copra was being prepared for shipment. Three warehouses still stand in Barangay Sabang as a reminder of that golden era. To date, the Rawis Port has been improved and is now the hub of bigger vessels. Borongan has still a long way to go. Through storms and fires, attacks from Moro marauders, it has remained strong amid the adversities. The Boronganons have withstood the test of time. Like Rizal, they might have become migratory, but in the end, they will return to enjoy the distinctly Borongan way of life. Like the Municipal Hall, they have changed with the times, and will rise from defeat to gather victory not just for the present but for the future. Like the Borongan Bridge, they will welcome the coming of new ideas and technology, and like the Hamorawon Spring and the acacia, they will stand steadfast with their dreams and aspirations for themselves, their families and their beloved town. As the town and its people move on to another page of history, the acacia will continue to stand in the heart of town to once more witness Borongan as it moves ahead to the future.